It was a Thursday, June 28, 1862 in Victorian England, and a First-Class match was about to begin at Hove between Kent and hosts Sussex. English cricket was in a state of transition at the time, making the laborious and contentious change from the early underarm mode of bowling to round-arm and finally, to the over-arm form of bowling that we know today. Overs of the time consisted of 4 balls only, and there were many who sported top-hats and gaiters in the field. Pitches were far from perfect and there was always the anticipation of something unusual happening during the course of the game. John Hale, skipper of the Sussex team and a former Rugby School alumnus, opted for first strike. He might have regretted the decision soon, because Sussex were bowled out for 101, off 82 overs. Kent’s main wicket-taker was one Joseph Wells, from Penshurst Place, with figures of 28-13-35-6. It seems that Wells was a nephew of Timothy Duke, related to the Duke family of Penshurst that had been in the business of manufacturing their celebrated brand of six-seam cricket balls with a Royal Patent in 1775. His son, of course, earned more fame, and went by the name of HG Wells. – For Western Province (WP) against Griqualand West (GW) at Johannesburg in 1931-32 – Crisp took 8 for 31 in the GW first innings of 114, including a hat-trick. He also took 5 in 8 balls, 6 in 12, and 7 in 25. – For WP against Natal at Durban in 1933-34 – Crisp took 9 for 64 in the Natal first innings of 214. In this connection, perhaps a special mention should be made of Neil Wagner, born in 1986 at Pretoria, but whose magic figures materialised while playing for Otago against Wellington at Queenstown in Plunket Shield 2010-11. Further scrutiny of the available data shows that there had been 8 instances up to the year 1899, 24 instances from 1900 to the year 1999, and 12 instances from the year 2000 till date. There are only two Indians in this list: Sadanand Mohol and Shankar Saini, both of whom have played relatively few First-Class matches in their respective careers. Let us look at the careers of these two in a little detail. A right-arm fast-medium bowler, Mohol played 45 matches, capturing 165 wickets at 21.32. His best innings bowling figures were 8 for 42. He had five or more wickets in an innings 9 times and 10 or more wickets in a match twice. He was one of the only two quick bowlers to be selected for the Indian team on the 1967 tour of England, the other being Subrata Guha. Mohol, however, was never awarded a Test cap. He was playing for the Indian Board President’s XI against a team with the rather involved name of Maharashtra Small Savings Minister’s and Life Insurance Company Chairman’s Combined XI in a Defence Fund Match at the Club of Maharashtra Ground in Poona in 1965-66. Opening bowling with Maharashtra teammate Vasant Ranjane, Mohol captured 6 for 70 from his 29.5 overs (7 maidens) in the opponents’ first innings total of 220. Mohol took a hat-trick with the wickets of Ajit Wadekar, Sudhakar Adhikari, and Madhukar Gupte, then followed up with the prize scalp of ML Jaisimha with his next ball to become the first Indian bowler to take a 4-in-4 in First-Class cricket. There was a feeling among the cognoscenti that Mohol had turned out to be a bit of an underachiever as far as his First-Class career went, given his talent and the promise that he had shown in his early days. Saini was a right arm medium paced bowler. He played 20 matches capturing 57 wickets. His best innings figures read 6 for 21, and his bowling average was 22.85. He had 5 wickets in an innings 4 times, but never 10 wickets in a match. Saini succeeded in establishing his name in the record books against Himachal Pradesh at Delhi in 1988-89. Delhi declared their first innings closed at 448 for 3 after their first wicket had fallen without any runs on the board. Raman Lamba (118) and Manoj Prabhakar (229*) added 280 for the second wicket. Saini did not bat in the innings. Himachal Pradesh, a relatively inexperienced and definitely weaker unit, were dismissed for 102 in the first innings, Saini capturing 6 for 21, his best ever innings bowling analysis. His last two deliveries of the first innings got him the wickets of Shakti Singh and Anil Sen. When he came on to bowl in the second innings, his first delivery earned him the wicket of Shakti again, and Satish Mehra with his next ball. Saini thus became only the second, and till date, last, Indian bowler to capture a 4-in-4, with the added twist of doing this over two innings and capturing the wicket of one batsman (Shakti) twice in the sequence. Shankar Saini takes four wickets in four balls; dismisses Shakti Singh twice in a hat-trick – In fact, Saini became only the second bowler to dismiss the same batsman twice in the same hat-trick. Back in 1844, William Clarke of all-England had done the same to John Fagge of Kent. The last bowler till date to have accomplished this feat of a 4-in-4 has been Kelly Smuts, for Eastern Province (EP) against Boland at Paarl in 2015-16. Smuts had a magical game, scoring the only individual century of the game (108) in the only EP innings of 442, and capturing 7 for 36 and 6 for 35. The feat occurred in the Boland second innings of 144, when Smuts took the wickets of Emile Kriek, Thomas Kannemeyer, wicketkeeper Junaid Cassiem, and Ferisco Adams. EP won by an innings and 93 runs. Pat Pocock: An off-spinner in the classical mould – It would be a grave injustice to the enigmatic and brilliant Surrey off-break bowler Pat Pocock if we were to conclude this narrative without mentioning his wondrous deeds against Sussex at Eastbourne in August 1972. Pocock’s initial analysis of 2 for 69 in the first innings of 226 was but a prelude to the astounding occurrences to follow in the 2nd innings. The scorecard makes the bare statement that Pocock had a second-innings analysis of 7 for 67 from 16 overs. – The final over of the innings (with Sussex needing 5 to win) was bowled by Pocock and went as follows: www1ww, the final wicket being a run out. 5 wickets falling in the final over is unique in First-Class cricket. 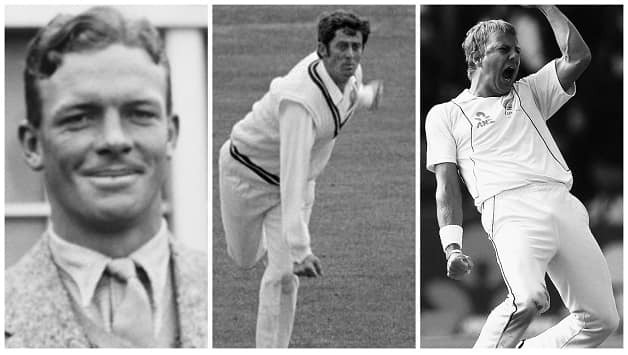 Pocock set three world records: – 5 wickets in 6 balls, equalling Bill Copson (this record has, of course, been subsequently surpassed by Wagner as stated above, with his 5 wickets in the same 6-ball over), – 6 wickets in 9 balls, and – 7 in 11. In effect, then, Pocock’s 4-in-4 was also accomplished over 2 overs. Vidarbha posted a total of 800 for 7 declared against Rest of India in the ongoing Irani Trophy at Nagpur to provide the 35th occasion of a team posting a total of 800 plus run in a first-class game. It also provides the seventh occasion of a team posting a total of 800 plus runs in the first-class game on Indian soil. The following table lists all such occasions.